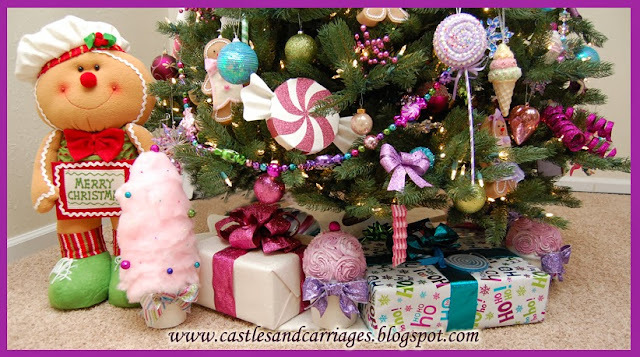 This is the first of many Candyland Christmas tutorials that I have for you this season. 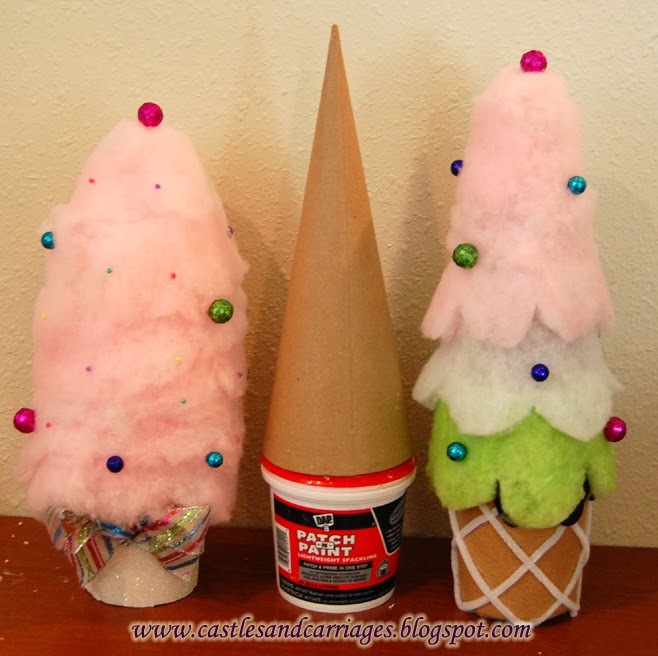 What I am going to show you today is how to make the faux cotton candy and ice cream trees. 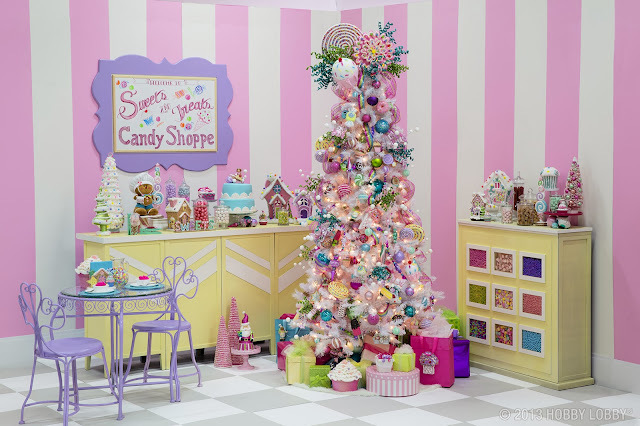 If you end up making these sweets trees, please let me know so I can feature you on my blog! Container of sorts (I used cleaned curry containers from Costco, I have an emptied spackle container shown here -- whatever you have around that will fit the cone). Embellishments: ribbon, pastel beads and vase fillers. 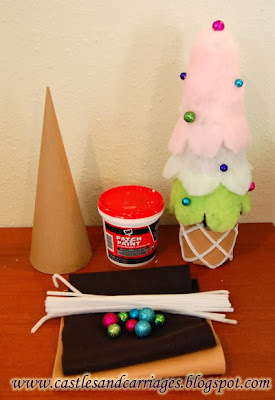 The first step is to make the faux ice cream/cotton candy. Remember that you are working with fabric dye so please don't wear nice light clothes. Also you want to protect your workspace by putting something underneath your batting (like poster board). 1. Take batting and measure around cone. Cut batting. 2. Put on your gloves and shake the fabric spray can. 3. 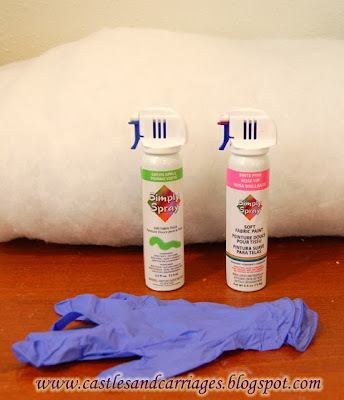 Gently spray the batting and use gloves to rub any uneven coloring that occurs. 4. Flip over and repeat. Let batting dry (mine took 30 mins). 5. Repeat steps #1 - 4 for pink batting. 6. Cut into scalloped shape and set aside. On to the ice cream cone! 1. The amount of felt I needed to fit around this spackle container was about 16.5 inches long and about 5 inches wide. The size of felt you need may vary depending on what container you use. 1/2 a yard of felt should be plenty for two trees. So cut your felt to fit around your chosen container. 2. 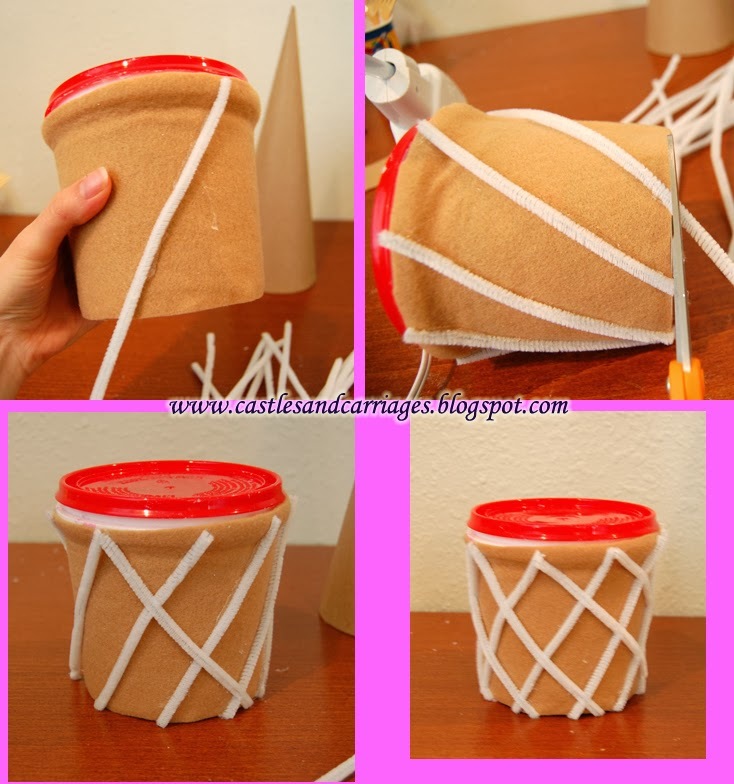 Using a glue gun, glue your felt (pulling taut along the way) to your container. Now we are going to add our pipe cleaners/chenille stems. 1. 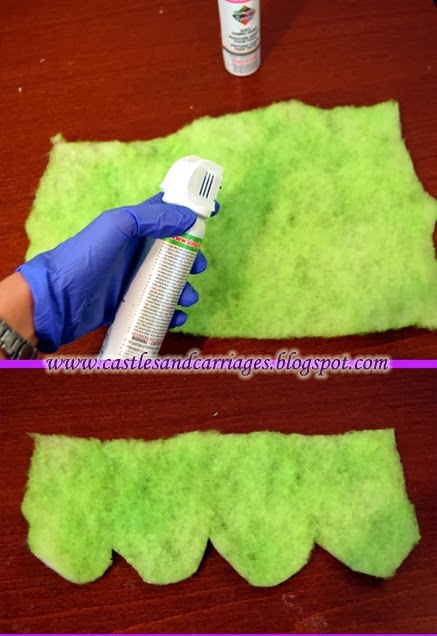 Using your glue gun, glue your chenille stems in a diagonal pattern, trimming the excess as you go. 2. Then glue in the opposite direction creating a nice diamond shape pattern on the container. 3. Now add your cone to your container. 4. Cut your dark brown fabric in a scalloped pattern. This is going to be your chocolate dripping along the sides. Keep in mind that some of it will be covered by the faux ice cream. 5. Glue dark brown "chocolate" scalloped edge to your container. Now finally, we are going to add our "ice cream" layers. 1. 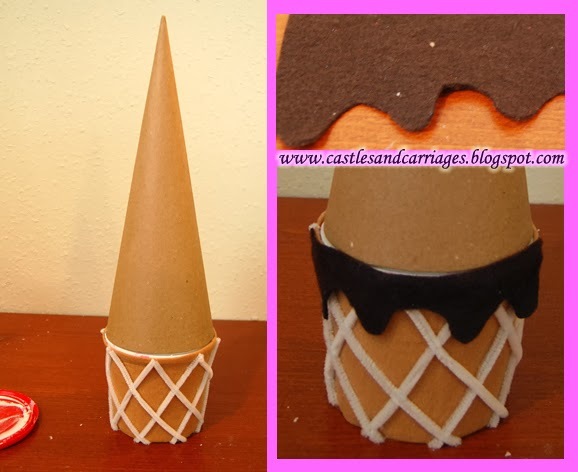 Using the green scalloped batting, glue around cone. 2. Then cut out white scalloped batting and glue on the cone slighting overlapping the green. 3. Cut off a bit of the cone if you desire a more rounded top then add pink scalloped batting. 4. Take a small piece of pink batting, stretch it out a little and cover the very top. 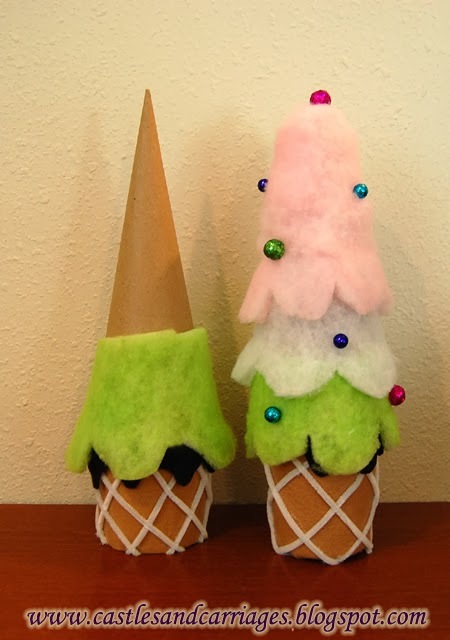 The ice cream tree is much more complicated than the cotton candy one. For the cotton candy tree, all I did was glue white glittered paper around the container and pink batting around the cone. Cut your pink batting into strips (3 - 4 inches wide). 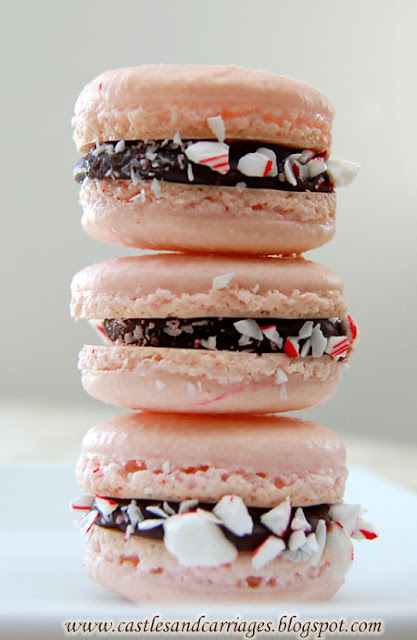 You'll have to stretch and tease the batting to manipulate it into a cotton candy appearance. These are so beautiful and creative! Thank you for sharing.